A combination of lack of inspiration, a new job, holidays and general laziness have been conspiring against me over the past few months. I’ve hardly put pen to paper except to doodle in the margins of my notepad during exceptionally boring meetings. I envy those comic artists and illustrators who manage to pour their creativity onto paper week in and week out; keeping the masses entertained with unwavering dedication. I recently took time out to holiday in Greece. Kefalonia to be precise. Despite my love of crisp autumnal mornings and streets scattered with crunchy brown and yellow leaves (if we’re lucky – usually it’s soggy, wet, mouldy leaf litter and unpredictable weather), I think a short stint in warmer climes is good for the soul. Every day for a week, I tentatively opened the curtains (as I would do in the UK) wondering whether the skies would be dark and foreboding, and every day I was delighted by clear blue skies and golden sunrise. During the first couple of days, two things stood out. 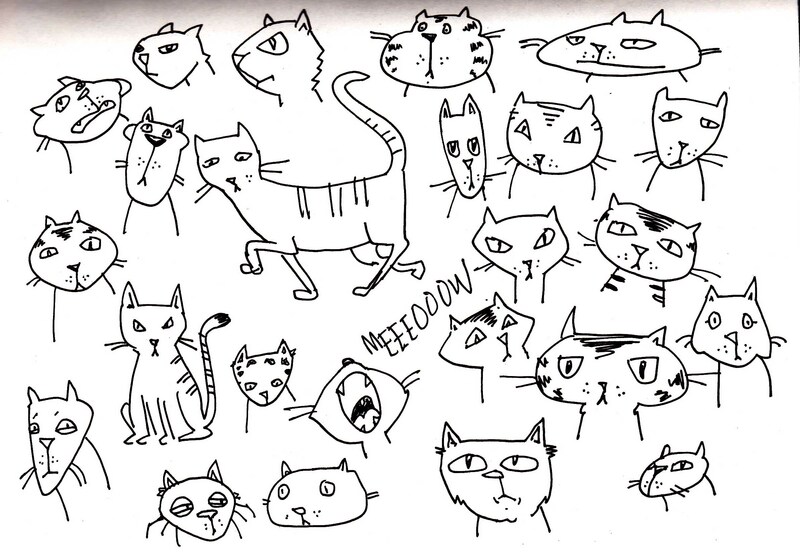 The first, which I’ve drawn in this post, was the extraordinary number of ferrel cats. Unbeknownst to me, Kefalonia is often referred to as the Island of Cats. They are everywhere, lurking in alleyways, behind walls, under cars, in supermarkets, beneath bushes and in restaurants. Always watching. If you feel something brush against your leg or catch some movement out of the corner of your eye, it’s likely to be a cat slinking past you. 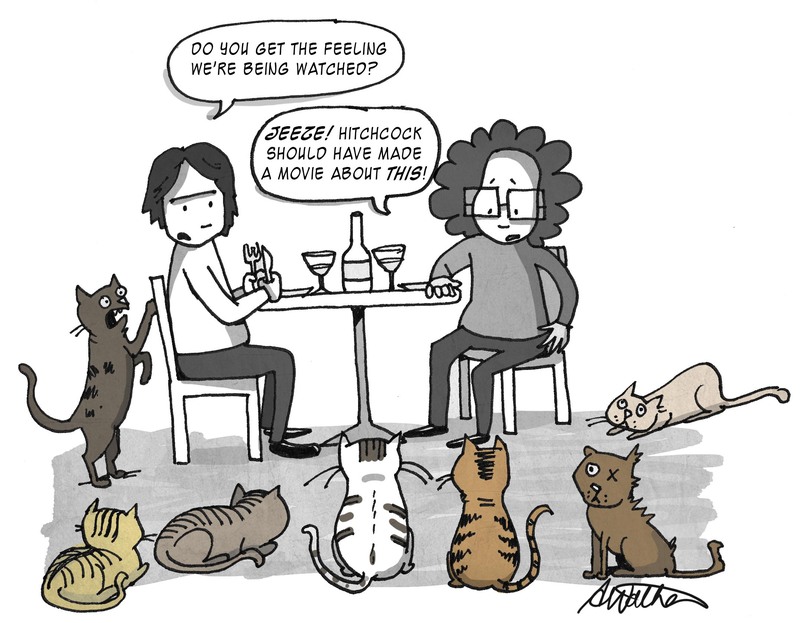 Not one meal was consumed without a handful of cats watching us put every forkful of food to our mouths. This was the first thing that made me put pen to paper in weeks. A little excerpt from my sketch pad! My second observation (amongst others) will be covered in my next post or posts (depending on my mood) so stay tuned! This entry was posted in Animals, Cats, Life, travel and tagged animals, cartoon, cats, comic, funny, Greece, holiday, humor by bighair63. Bookmark the permalink. Wooohooo, you’re back. I have missed you (in a non creepy way).